You may not know it to look at them, but the latest 13-inch MacBook Pro with Retina display models are thinner and lighter than the Retina systems they replace. Lighter is always better in a portable—but factor in the new MacBook Pro’s increased battery life and the faster integrated graphics, and you have a laptop you can love. The new 13-inch Retina MacBook Pros look very similar to the previous crop (released in February), but they are 2 ounces lighter and 0.04 inch thinner. 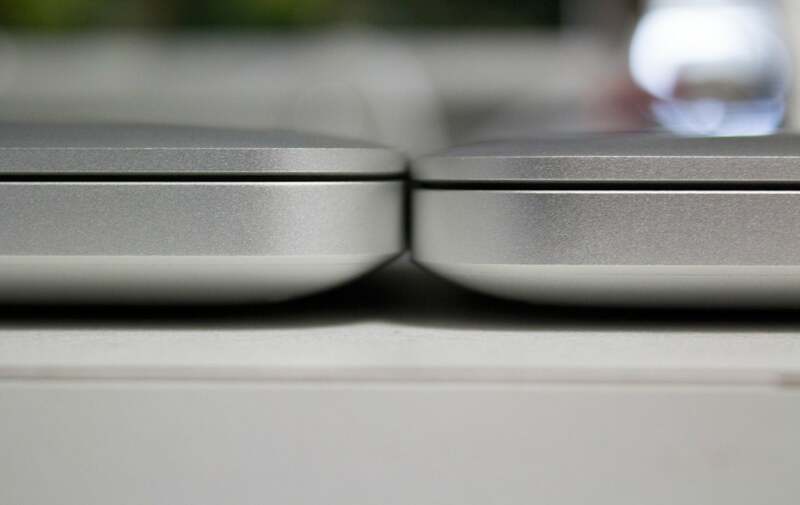 Even when you compare a new model side-by-side with an early 2013 Retina MacBook Pro, the difference isn’t obvious. The new 13-inch Retina MacBook Pro (right) is thinner and lighter than its predecessor. The new 13-inch Retina MacBook Pros have the same connections and ports as the previous versions: one HDMI port, two USB 3.0 ports, a headphone jack, and an SDXC card slot. The new laptop also has two Thunderbolt 2 ports, which are supposed to deliver faster throughput than the previous-generation Thunderbolt ports that the older laptop carried. Though some manufacturers have announced Thunderbolt 2 peripherals, none of these products have yet arrived in our lab for testing. Thunderbolt 2 uses the same cables and connectors as Thunderbolt—but to get the increased bandwidth, you need Thunderbolt 2 devices. Like previous Retina MacBook Pros, the new 13-inch models lack ethernet ports, FireWire connectors, and optical drives. To get those extras, you’ll have to devote available adapters to them ,and connect the optical drive externally. If you need FireWire and an optical drive more than anything else, you can buy Apple’s non-Retina MacBook Pro with built-in SuperDrive and FireWire 800 for $1199. Apple updated the built-in Wi-Fi to support the latest 802.11ac specification. As we found in the latest MacBook Air with 802.11ac Wi-Fi, the new spec permits much faster wireless transfer speeds. The bright and glossy Retina display remains unchanged, which is fine with me. It packs a resolution of 2560 by 1600 pixels into a 13.3-inch-diagonal screen. When you use the laptop in the default 1280-by-800-pixel doubled mode, the individual pixels that make up images and text are not discernible. The new Retina MacBook Pro features two Thunderbolt 2 ports. All of the new 13-inch MacBook Pros come with fourth-generation Intel Core i5 (Haswell) processors. The entry-level 13-inch Retina MacBook Pro costs $1299 and packs a dual-core 2.4GHz Core i5 processor and 128GB of flash storage. Its relatively low storage capacity may limit the amount of music, movies, and photos that you can can keep locally, but you can work around that ceiling by using external drives and cloud storage. More problematic is the smallish 4GB of RAM included with the $1299 MacBook Pro, especially since you can’t upgrade memory on these laptops after purchase. With that in mind, consider ordering your MacBook Pro with the $100 optional upgrade tp 8GB of RAM. Alternatively you can choose the $1499 model, which has the same processor as the $1299 laptop, but with 8GB of RAM and 256GB of flash storage. The high-end 13-inch Retina MacBook Pro, priced at $1799, has a dual-core 2.6GHz Core i5 processor with 8GB of RAM and 256GB of flash storage. The new Retina MacBook Pros use PCIe-connected flash storage, which can be much faster than the SATA-connected flash that earlier MacBook Pros used. The smaller-capacity flash in the 2.4GHz laptop was relatively pokey at writing data, but it was fast at reading; and matched against last year’s entry-level model with its 256GB SATA flash storage, the laptops had identical speeds. On the new high-end 2.6GHz Retina MacBook Pro, copying 6GB of files and folders from one spot on the drive to another was 34 percent faster than the same task on the early 2013 2.6GHz model. Like the 13-inch models preceding these, the new Retina models rely on integrated graphics. This year, however, the systems use Intel’s higher-end Iris graphics. Our tests show the new MacBook Pros getting between 45 and 65 percent higher frame rates than the early 2013 models, with their Intel HD 4000 integrated graphics. We also ran our benchmarks on a recent 13-inch MacBook Air—a $1099 model with a 1.3GHz dual-core Haswell Core i5 CPU, 128GB of flash storage, 4GB of RAM, and Intel HD 5000 graphics. The new entry-level $1299 13-inch Retina MacBook Pro was 13 percent faster than that MacBook Air in both our Handbrake and MathematicaMark 9 tests. Cinebench OpenGL and Heaven graphics test results were about the same, but the frame rates we obtained on the Valley benchmark test were 25 percent higher on the Pro than on the Air. The 13-inch MacBook Air is a pound lighter and a little thinner than the MacBook Pro, but of course it also lacks the ultra-high-resolution Retina display of the MacBook Pro. Both new 13-inch MacBook Pros lasted much longer on a single battery charge than the early 2013 models did. The new entry-level 13-inch Retina lasted 10 hours, 51 minutes in our wireless Web browsing test, while the high-end 13 lasted 10 hours, 11 minutes. The previous model lasted just 7 hours, 15 minutes. For its part, the MacBook Air lasted 12 hours, 42 minutes in our Wi-Fi Internet browsing battery test. The standard-configuration 13-inch Retina MacBook Pros come with a 2.4GHz or 2.6GHz dual-core Core i5 processor. 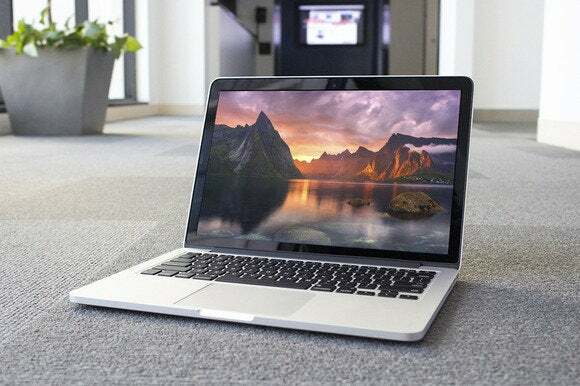 With much-improved battery life and graphics performance, the late 2013 13-inch MacBook Pro with Retina display should have owners of older Mac laptops looking to upgrade. The entry-level model’s 128GB of flash storage may not be spacious enough to accommodate all of your media files, however, and you should seriously consider doubling the 4GB of soldered-down RAM to 8GB at the time of purchase. The high-end model’s higher price seems to be justified by its faster CPU, standard 8GB of RAM, and 512GB of superfast flash.